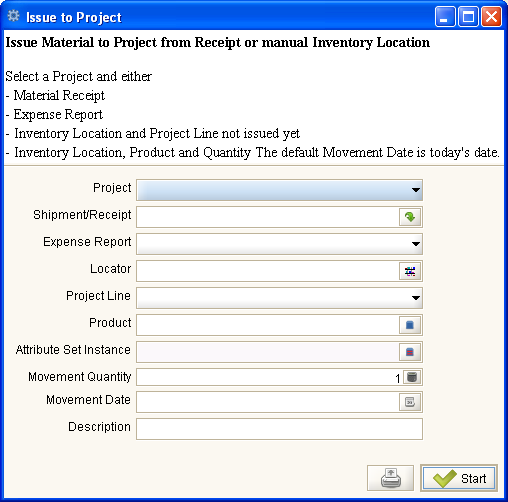 - Inventory Location, Product and Quantity The default Movement Date is today's date. This process associates different movements within ADempiere with the selected project. For Material Receipt/Shipment: Associates the corresponding Material Receipt/Shipment with the project, and for every line creates a Project Issue. Then Find or Create a new Project Line for the related order. If not Material Receipt, then makes the same process for Time Expense, or for a Project Line, or for Inventory. Project Lines and Project Issues with the related records. This page was last modified on 15 December 2006, at 12:24.